IP-redator? I-Predator? IPredator, got it. Whatever their name is, they’re aiming to protect and hide your internet usage. Despite being based in a country that’s a member of the 14 Eyes Alliance, IPredator assures its users that only their subscription information will be given when requested by agencies or government bodies. No history logs, DNS requests, and other personal information are kept by the VPN according to their policy. With the price of $8 a month, they’d better offer some quality services. We tested their service to share our findings in this review. Payment Methods: All sorts of options available! IPredator users have multiple methods of paying for the VPN. PayPal, Bitcoin, Ok Pay, Payza and Payson are all available options. Other methods are also available by request. This is a great feature that caters to users looking to pay with an array of different options including cryptocurrency – something we love to see. IPredator can be installed on a number of devices, including Windows, Mac, iOS, Android, Linux, BSD, and even routers. Users can connect up to two devices per license, which is somewhat lacking – but offset by the inclusion of router support. Note: IPredator does not offer native clients or apps for any of the platforms. Users will have to manually set up the VPN through OpenVPN, Viscosity or PPTP. Creating an account with IPredator is quick and easy. All you need is to provide a username, email, and password. That’s it! Short of not needing to sign-up at all, that’s about as easy a sign-up process as you’ll find! IPredator can be used via OpenVPN, Viscosity, and PPTP. We tested the VPN using OpenVPN and it was really simple. Users of OpenVPN know how simple the interface of the client looks. Everything can be easily seen and accessed, great for users not used to using VPNs or digging around for advanced options. You don’t have to spend hours searching for settings to import files, change settings, and connect to the VPN of your choice. Customer Support: Online chat is available! IPredator offers online chat as well as email support. 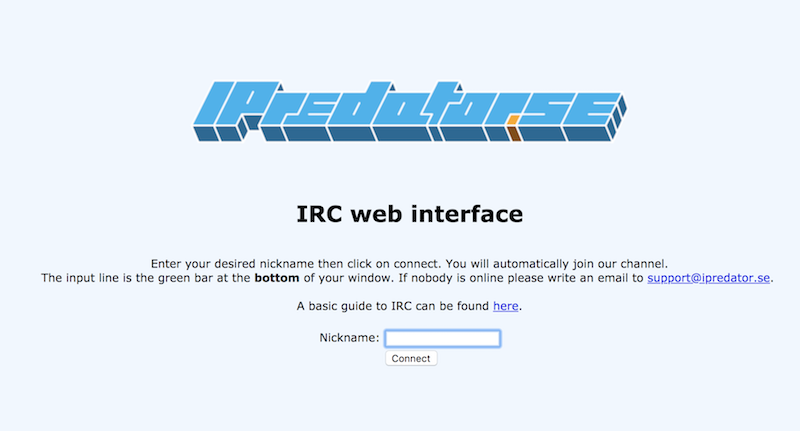 You can connect to their IRC client to start up a chat or shoot them an email if they don’t respond. Product Documentation: Looking for answers? You got ’em! We loved finding out that IPredator has a detailed guide for all users. From an exhaustive FAQ page to detailed step-by-step instruction manuals with pictures, the website contains all the answers users are looking for. Their FAQ is information-heavy, offering plenty of information for users of all skill levels. Their creators did a really good job providing as much support as they can. Overall, we’re pleased to see such great support. After all, not everyone is a VPN expert! The legal framework of IPredator consists mainly of the Electronic Communications Act 2003 389. The VPN receives strong legal protection under Swedish Law because it’s a prepaid, flat-rate service. They are not required by anyone to maintain user databases. Long story short, they only have the subscription information of users. They do not collect traffic history, IP addresses, network providers, and other personal information. Worst comes to worst, they are only required to hand over a user’s subscription information to Swedish authorities, nothing more. If you use an anonymous email and payment method, you’ll have no concerns regarding your personal information being discovered! Can IPredator really keep your IP and DNS secure with their only server? Let’s find out. IPredator did a good job of hiding both our IP and DNS information. We’d feel secure using their service, and that means you should too! Great job IPredator – another thumbs up from us. IPredator uses military-grade AES-256-CBC encryption. This is a very secure connection that’s theoretically uncrackable because of the massive amount of key combinations. It’s the security we look for in a good VPN, and IPredator offers it – good stuff! Fortunately, the VPN lives up to our torrenting expectations. We expected IPredator to support torrenting since it was created by the co-founder of Pirate Bay (which itself originated in Sweden) and we weren’t disappointed. Their FAQ section features two different questions about both uTorrent and BitTorrent. It’s clear they fully support users who want to torrent. IPredator supports torrenting, but as you’ll find out below, it’ll probably take days or months for you to download anything. So if you’re looking for speedier options, check out our list of the best VPNs for torrenting. Thankfully, IPredator has a refund policy and it comes with a fair condition. They claim to give users a refund if the VPN really doesn’t work. Before doing so, they will try to fix the problem to the best of their abilities. We think that’s a fair condition before handing your money back over. After all, some less-than-honorable customers may just want to use it for a day, then refund. We have no problems with them giving you support if and when you need it! 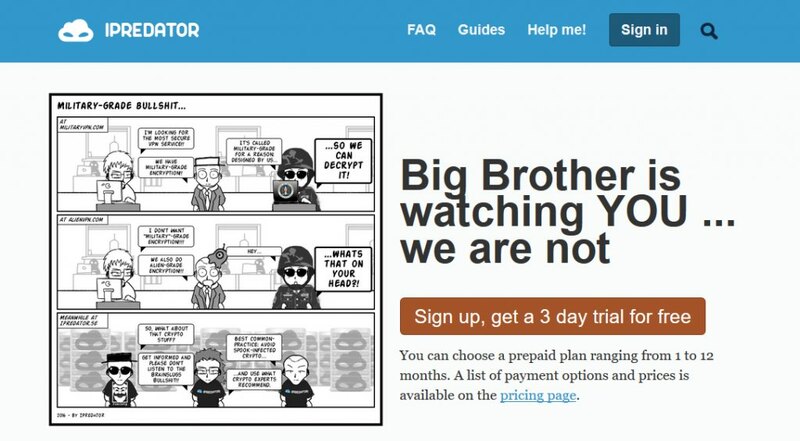 “Big Brother is watching YOU… we are not,” seems like a line out of a dystopian novel (1984, anyone?) but it’s actually a statement from IPredator’s website. It was created with the main goal of providing access to users who are looking to get around censorship. The Swedish VPN provides a decent amount of servers, 100 to be exact. But those servers are all located in Sweden – ah. It’s not a small amount, but it’s not a huge amount either, considering we see VPNs offering thousands of servers at a time – and located across the world too. We could only test 1 sever, their Swedish server (where all their servers are located). Instead of testing a U.S. server for comparison, we were only left with the one option. The performance of IPredator was terrible, to put it bluntly. While executing the IP and DNS leak tests, the pages took a few minutes to load. Sending an email quickly was impossible with the VPN turned on. Overall, a disappointing experience. Considering they focused so heavily on providing servers in one location, you’d expect them to provide high-quality servers, as a small trade-off from the lack of country variety. Not so. If you’re looking to buy IPredator to watch Netflix all day, we’re sad to say that you’ll be disappointed. 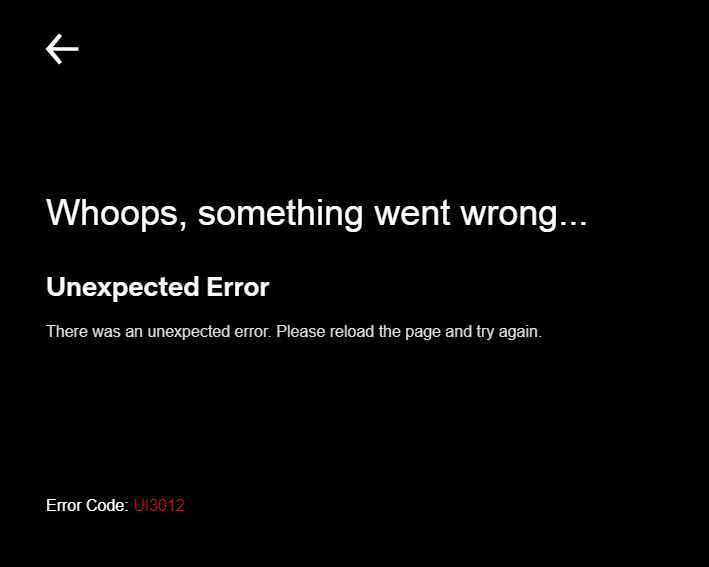 Accessing Netflix via IPredator isn’t currently possible. A disappointment, to say the least. Looking to get your Netflix fix? Check out our list of the best VPNs for Netflix. 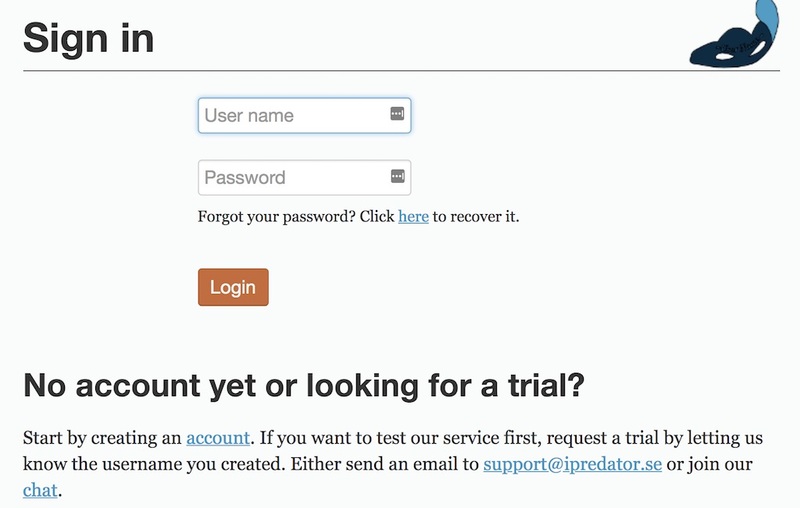 Before purchasing IPredator, you can request a free trial to see if IPredator is really for you. It only lasts for three days and it can only be accessed by sending an email or chatting with their staff. IPredator can be yours for the price of €6, $8, or 50 kr per month. Customers can choose from 1, 3, 6 or 12-month prepaid plans. In our opinion, IPredator is a bit pricey for its services. The lack of location variety of their services means you’re not getting a whole lot of VPN freedom for your money. Just for comparison, ExpressVPN costs $8.32 per month on a 12-month plan and offers thousands of fast servers in 150 locations plus Netflix access. Now, which one do you think is a better deal? IPredator doesn’t have a kill-switch which would be very useful for VPN users – especially those who torrent! Adding a kill switch would certainly make their $8 service worthier of its price tag. It’s a shame there’s not one included, as overall IPredator’s offering has been fairly strong – this is just another blip. Hopefully, it’s something they’ll add in the months to come. In 2009 IPredator created the VPN as a response to the growing trend of Internet censorship around the globe. One of the major moving parts was the co-founders of the Pirate Bay. Their goal was to provide non-discriminating access at a flat rate to the public. Besides managing IPredator, their company is also involved in projects regarding censorship-free networks, which is reassuring to those of us who care about privacy and unrestricted access. IPredator is most likely a Swedish VPN. However, the company is incorporated as PrivActually Ltd. in Cyprus. Guess where Cyprus is (or isn’t)? It’s not under the Eyes jurisdiction. Even if we account for the team in Sweden it shouldn’t be too much of a cause of worry. Since IPredator only keeps subscription information, there isn’t anything to worry about – especially given their anonymous payment options on offer. IPredator is a good VPN, but they can certainly do better. They support torrenting, have a no logging policy and good encryption, and the service is compatible with most devices. What they need to improve on is their internet speed, Netflix availability, and their number of servers – as well as the range of countries they have servers in. Loading a simple page instantly can be done by most Internet and VPN providers, but IPredator failed to do that. It was off-putting how they failed to provide a fast connection considering the price they charge their users. Torrenting is possible but watching Netflix isn’t. If only they had a good connection, a compromise would’ve been possible with torrents. Still, it’s a muddy result. There’s a lot to love about IPredator. With some improvements to server options, speeds, and some Netflix access, IPredator would be a solid VPN choice. Until then, they have a way to go before we could recommend them to our readers. Looking for the perfect VPN for you? Check out our list of the best VPNs we’ve reviewed.